Construction works has begun at the Olembe sports complex in Cameroon which is anticipated to host the opening ceremony of the 32nd edition of the African Cup of Nations in 2019. The Minister of Sports and Physical Education, Bidoung Mkpatt, granted audience to a delegation from the Technical Control Mission in charge of the project-Egis Batiments International. Marc Vallée, the Director of Egis Batiments International in Africa said the purpose of the meeting was to evaluate the level of work already done at the Olembe construction site and also to have talks to ensure that all should go the right way for the project. 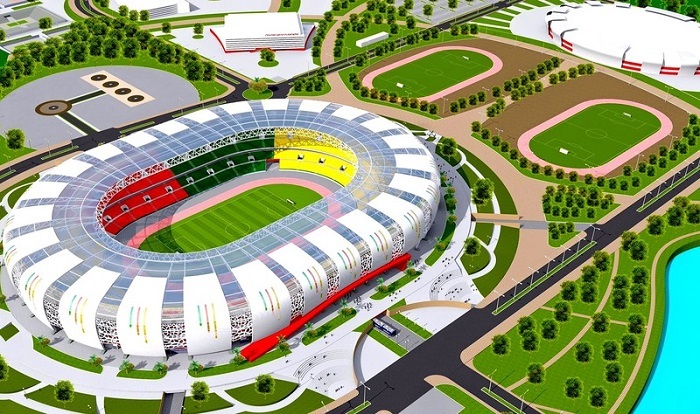 The Olembe Sports Complex will be one of the world class sports amenities with a 60,000-seater covered stadium, two training centres, a man-made lake, a gymnasium, an Olympic-sized swimming pool, tennis, basketball and volleyball courts as well as a hotel complex and several shopping areas. The Italian Piccini Group is responsible for designing and building the complex and Egis has secured the project management and works surveillance contract for a 27-month period. Currently, the project has moved from the design phase to the execution phase. “We are forced to mobilise our efforts to meet the set deadlines,” he said. The sports complex is set to be completed before January 2019. As a long-term designer, Egis Batiments International is one of the world leaders in construction and land development engineering. With a unique global offer, the Group combines engineering know-how with project development skills, capital investment, turnkey equipment, operations and mobility. Egis is a trusted partner and a partner in the key areas of transport and construction, water, environment and major works, as well as industry and energy, aviation, The city and digital engineering. It is a 75% subsidiary of Caisse des Dépôts and 25% of Iosis Partenaires & Fonds Commun de Placement d’Entreprise (shareholding of partner managers and employees).